Makassar, South Sulawesi. 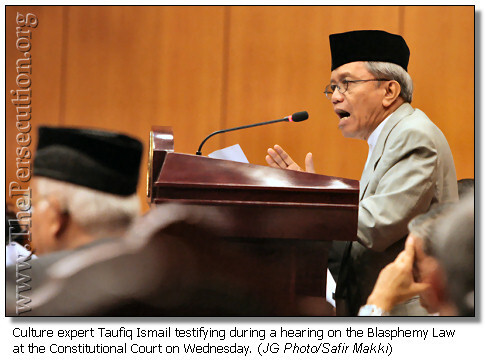 Minister of Religious Affairs Suryadharma Ali on Wednesday sought the support of the country’s largest Islamic organization, the Nahdlatul Ulama, in maintaining the country’s 1965 Blasphemy Law, which is under review at the Constitutional Court. “The consequences [if the law is annulled] are that people, figures, could establish new religions, declare new prophets, new angels,” Suryadharma told thousands of NU followers during the group’s 32nd national congress. “It could be one that could trigger a harmony breakdown. I expect that NU could also [work] together to solve this problem,” he said. Suryadharma shared a stage with Minister of National Education Mohammad Nuh in Wednesday’s congress to discuss religion and education issues in the country and in NU. He took the opportunity to enlist its support over the law. The 1965 law recognizes only six religions: Islam, Protestantism, Catholicism, Buddhism, Hinduism and Confucianism. Others are officially banned. It also prohibits alternative interpretations of recognized religions, including Islam. 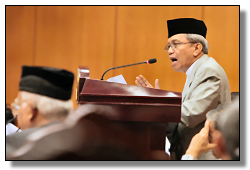 The Constitutional Court is currently reviewing the law following a demand for a review filed by human rights groups and the late former President Aburrahman “Gus Dur” Wahid, who was also a longtime former NU chairman. Suryadharma depicted a gloomy picture of conditions if the law was annulled. He said Islam and the Koran could be interpreted at will. Meanwhile, at the Constitutional Court, W. Cole Durham Jr., a professor of law and director of the International Center for Law and Religion Studies at Brigham Young University in the United States, testified via video conference. He noted that Indonesia had agreed to the International Covenant on Civil and Political Rights. “Indonesia thereby also accepted the obligation to protect freedom of expression, freedom of association, and equal protection under law, as well as to extend these protections to religious minorities,” Durham said. He agreed that the challenged provisions in the law were not only inconsistent with international human rights standards, but also open to multiple interpretations. Also testifying in favor of the plaintiffs were a host of legal and religious scholars and experts and former officials. A verdict will be delivered in mid-April.